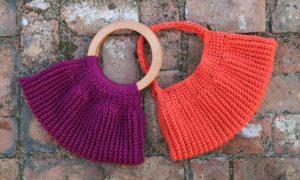 Cathy’s Classic Handbag- Make It For Me! I am thrilled to be able to join this event with my Cathy’s Classic Handbag. 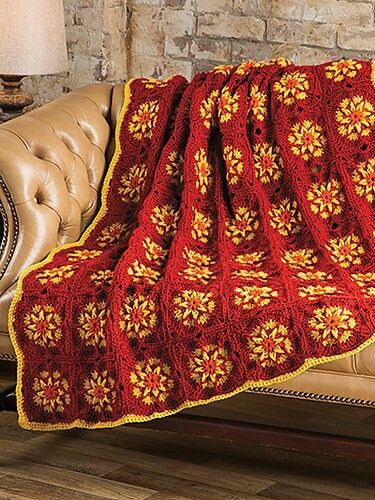 It is made with less than one skein, so you can reach into your stash. 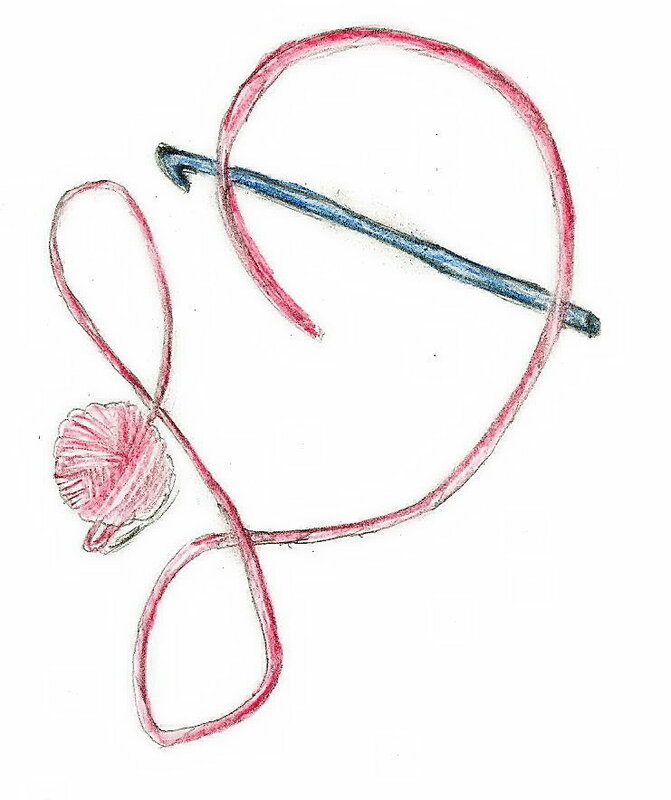 I even provided two options for handles…I really like the wooden round handles, but reality…I enjoy crocheting and getting to the craft store or even ordering on line means I am not finishing it the same day I start, so I provided a crochet handle option too. (If you want to learn how to attach the wooden handles, I have some instructions to help you here). This handbag was inspired by one of my students. Cathy always has a smile and carries herself with a rural, country chic charm. She brightens the room no matter what her day may have contained, and to get all dressed up I could see her with this classic style. A classic handbag that is fast to work up and has a lot of charm. A bit of stretch and a bell shape add to this great purse. 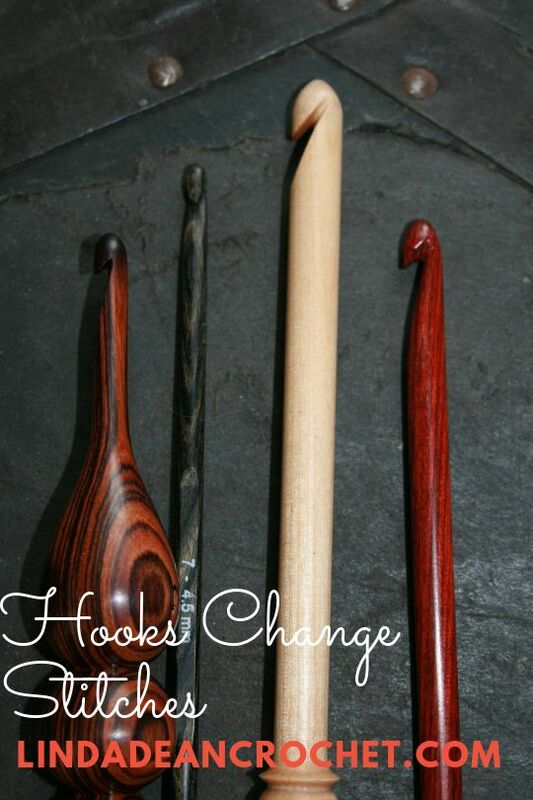 With optional handle options you can utilize a simple round wooden handle or crochet your own. The body of the bag is worked from one side across the bottom to the other side. 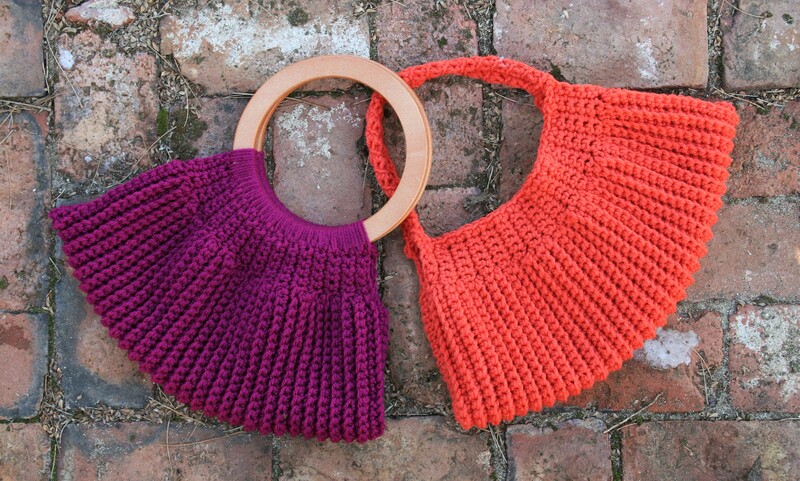 The body of the bag is worked with short rows. The handles of the bag are attached to the row ends of the bag. There are 2 options provided for handles. Row 6-61: Rep Rows 2-5 fourteen times. Ch 1, working along the row ends, 4 sc in first row end, working in a spiral (meaning that you are working in the round but are not joining the round, you continue working in the next stitch) to create a cord, blsc in the first sc worked in the end row, blsc in each sc until the cord measures about 14” (35.5cm), sl st to opposite end row from the beginning of the cord, sl st next 3 sts of cord to same st, sc in each row end across to beginning of the cord, fasten off. Folding handles together, whip stitch the open ends of the purse leaving between 1-2” open from the handles. I am so excited that I have been invited to join a vast array of talented designers to participate in the Elk Studios “Make it for Me” event. For the entire month of January, Elk Studios has been featuring a new design, from various designers, to encourage crocheters to make a little something for themselves. 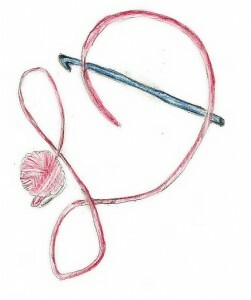 The rush of the holiday season creates hooks and yarn flying, but not usually in a project for the stitcher. Today I am happy to share my Corkscrew Scarf. 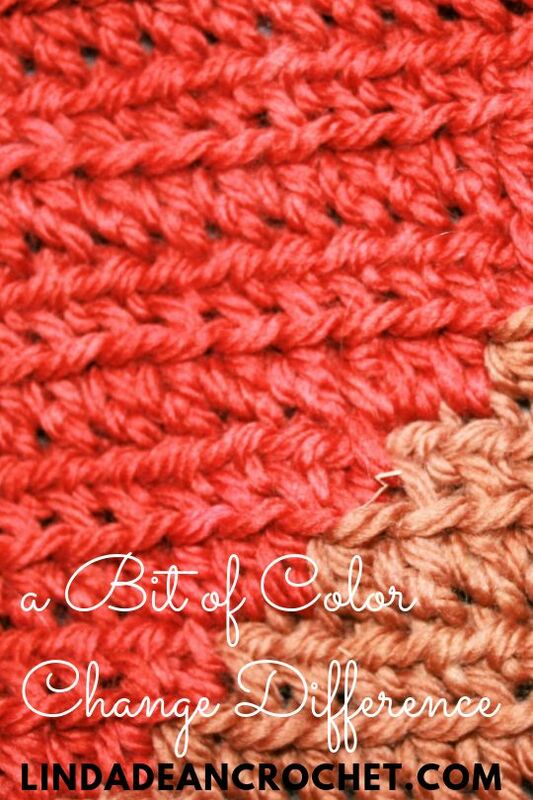 This is a fun project that can work up quickly in a wide variety of yarns, and is easily adjusted in length or width to make a scarf that fits just the way you want it. 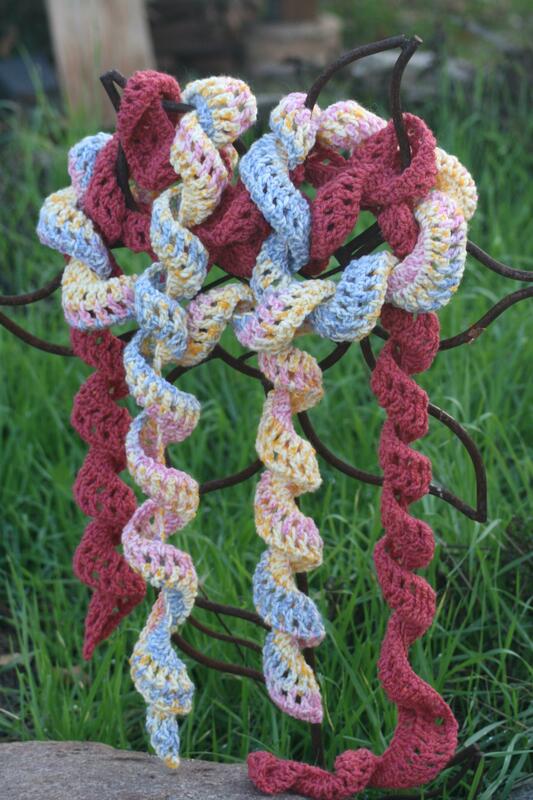 The Corkscrew scarf was originally created as a project that “new to crochet” students could practice some stitches, while learning how to read patterns, in the crochet classes that I teach at my local yarn store, Lofty Lou’s. 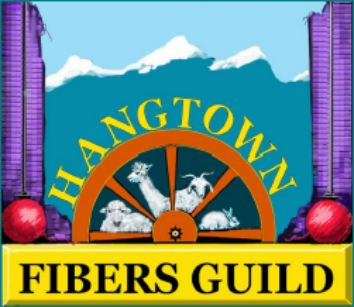 You can find me there most Tuesday mornings from 10-1:00, so if you happen to find yourself in the California Foothills, east of Sacramento, look us up and stop by. You will find the pattern below, if you prefer a printable version, you can download it here, Beginner Project-Corkscrew Scarf. 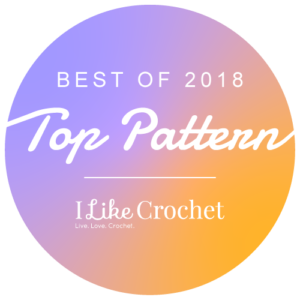 If you enjoy this pattern and want to explore more of my designs, check out more of my free and for sale patterns here. 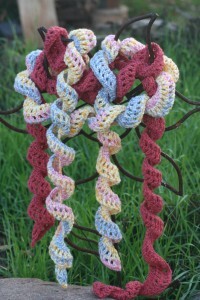 I hope you enjoy the Corkscrew Scarf, and take a little time to enjoy a time of Make it for Me. Twist and Turn! This fun scarf works up quickly and is a whimsical addition to any wardrobe. Row 1: Ch 182, dc in 4th ch from hook, 2dc in each ch across, turn. Row 2: Ch 4 (counts as dc and ch 1), dc in next s, *ch 1, dc in next st; rep from * across, turn. Row 3: Ch 3 (counts as dc), dc in same st, *ch 1, dc in ch-1 sp; rep from * across to last st, dc in last st, turn. Row 4: Ch 1, sc in same st, *ch 1, sc in ch-1 sp; rep from * across to last 2 sts, ch 1, sc in last st, finish off. Finishing Weave in ends; twist scarf as desired.